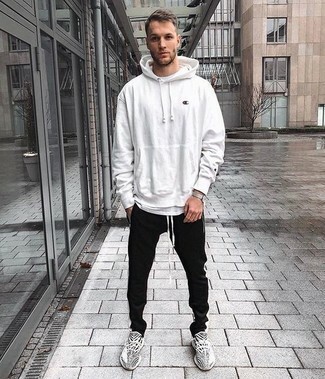 If you're all about functionality dressing when it comes to your personal style, you'll love this on-trend combination of a white hoodie and black sweatpants. When it comes to footwear, this getup pairs nicely with grey athletic shoes. 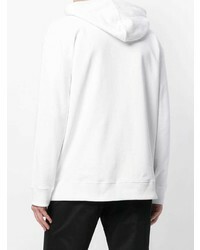 If you're on the lookout for a casual yet stylish look, try teaming a Raf Simons X Fred Perry tape detail hoodie from farfetch.com with black jeans. Both items are totally comfortable and will look great together. 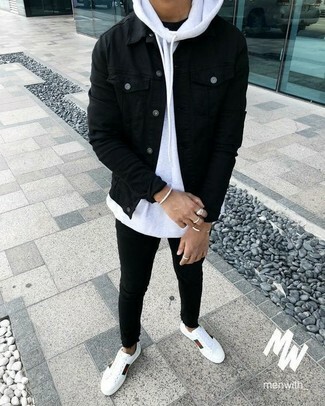 To bring out the fun side of you, round off your look with black and white high top sneakers. This laid-back combination of a Raf Simons X Fred Perry Tape Detail Hoodie and light blue jeans can only be described as incredibly dapper. You know how to tone it down: black canvas high top sneakers. 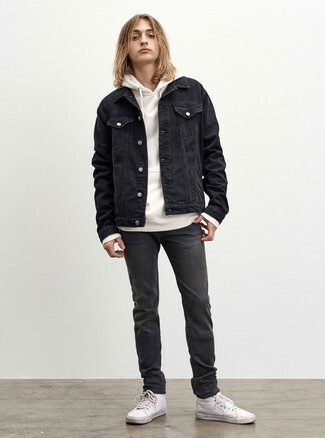 We all getup for comfort when it comes to dressing up, and this combination of a Raf Simons X Fred Perry tape detail hoodie and navy ripped jeans is a practical illustration of that. As for the shoes, choose a pair of red leather high top sneakers. 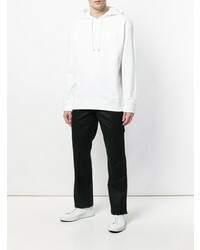 Such items as a Raf Simons X Fred Perry tape detail hoodie from farfetch.com and beige wool dress pants are the perfect way to introduce extra sophistication into your daily rotation. 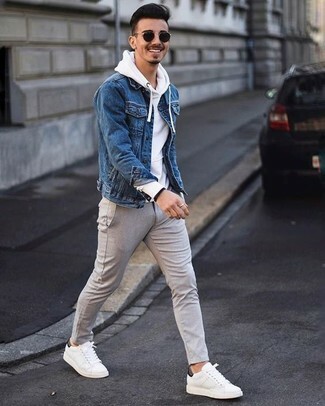 Break up your getup with more casual footwear, such as this pair of white leather low top sneakers. 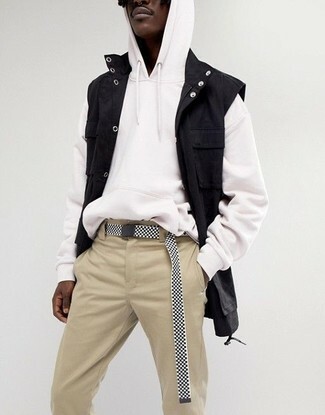 A Raf Simons X Fred Perry Tape Detail Hoodie from farfetch.com and black and white vertical striped sweatpants are a must-have off-duty pairing for many fashion-forward guys. 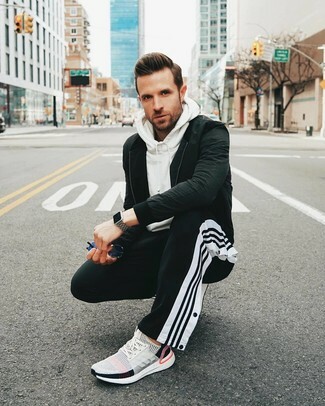 Complete this look with a pair of white athletic shoes et voila, your ensemble is complete. 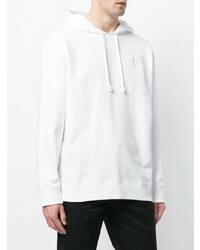 We all want comfort when it comes to dressing up, and this combination of a Raf Simons X Fred Perry tape detail hoodie from farfetch.com and black skinny jeans is a wonderful example of that. 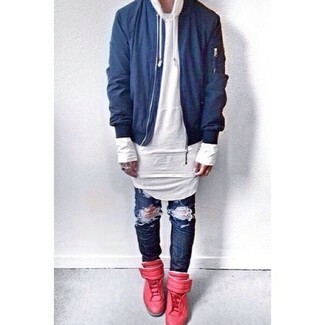 Lift up this ensemble with white leather low top sneakers. If you're looking for a casual yet on-trend outfit, dress in a Raf Simons X Fred Perry tape detail hoodie and charcoal jeans. Both garments are totally comfortable and will look great paired together. 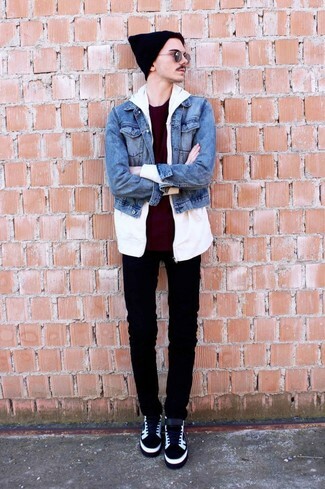 To break out of the mold a little, opt for a pair of white leather high top sneakers. 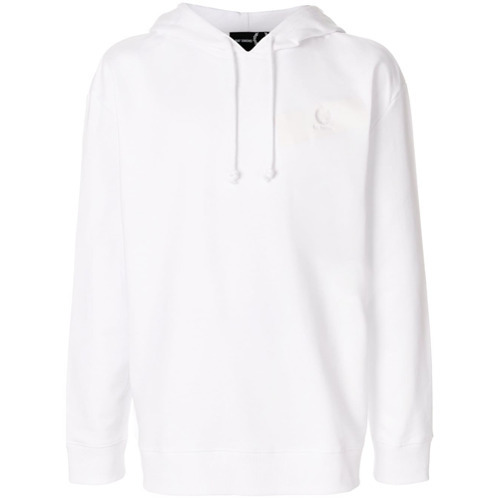 If you're looking for a casual yet sharp outfit, consider teaming a Raf Simons X Fred Perry white hoodie with beige chinos. Both garments are super comfortable and will look great when worn together.